The idea for an Internal Medicine Interest Group at LSU was first conceived in 1999 by Shamita Shah, then a medical student and now a fellow. As the idea became reality, the group was christened the Edgar Hull Society to honor the late Dr. Edgar Hull, past chairman of LSU’s Department of Medicine and renowned physician. Since its inception in 1999, the Edgar Hull Society has grown tremendously and now occupies a place among the largest campus organizations. Currently, we hold large monthly meetings each semester in which various speakers discuss their experiences in the field of internal medicine. Past meetings have covered topics as varied as general internal medicine, cardiology, gastroenterology, student research opportunities, and case presentations that bring the Morning Report experience to first and second year students. In addition, we coordinate an annual party, "A Taste of New Orleans," for senior medical students who intend to pursue internal medicine residencies. During the 2006-2007 academic year, we plan to continue holding meetings where students can interact with physicians in the field of internal medicine. Finally, with the continued development of the Edgar Hull Society web page, it is our hope that the field of internal medicine will receive even greater exposure among medical students both here at LSU and elsewhere. During his long and distinguished tenure as a Professor of Medicine, Dr. Edgar Hull was known as a warm character, a dedicated educator, and a superlative diagnostician. Born on February 20, 1904, in Pascagoula, Mississippi, Dr. Hull graduated from high school in 1920 at the age of 15, took his premedical training at LSU, and enrolled in Tulane Medical School at age 19. His academic excellence was acknowledged with membership in the prestigious Alpha Omega Alpha Honor Medical Society. Graduating in 1927, he interned at the Highland Clinic in Shreveport, Louisiana, from 1927-1928. He remained as a staff physician at the Highland Clinic until January 1929, at which time he engaged in the private practice of medicine in Pleasant Hill, Louisiana, until the fall of 1931. He was a charter member of the LSU School of Medicine faculty, joining the ranks of the new medical school in 1931 as an instructor and quickly working his way up to the rank of Professor of Medicine in 1939. In 1937, he was certified by the American Board of Internal Medicine. Dr. Hull became the Acting Head of Medicine in 1939 when Dr. George Sam Bel, the first Chair of Medicine, died. In 1940, Dr. Hull became the Department Chair, a post that he held until 1954, when, at his own wish, he stepped down and Dr. Walter Akenhead became the Department Head. Dr. Akenhead died in office in 1960, and Dr. Hull was persuaded to resume the headship of the Department of Medicine, which he held until 1966. A renowned cardiologist, Dr. Edgar Hull was also a man of vision and indefatigable energy. In 1945, he foresaw the need for a third medical school in Louisiana and suggested its present location in Shreveport. He helped to develop the LSU Postgraduate School of Medicine and assumed its directorship. From 1948-1949, he served as Acting Dean of the School of Medicine in New Orleans. In 1966, he left LSU-NO to become the first Dean of the LSU School of Medicine in Shreveport, a position he retained until 1973, when he retired and returned to making house calls on his former patients in Pascagoula, Mississippi. Dr. Hull’s reputation as one of the finest, most inspiring teachers and physicians ever to serve LSUHSC and Louisiana has made him legendary. In 1972, Pope Paul VI honored him for his outstanding work in the medical and religious fields by making him a knight of St. Gregory the Great, the highest recognition that a pope can give to a layman who is not a head of state. 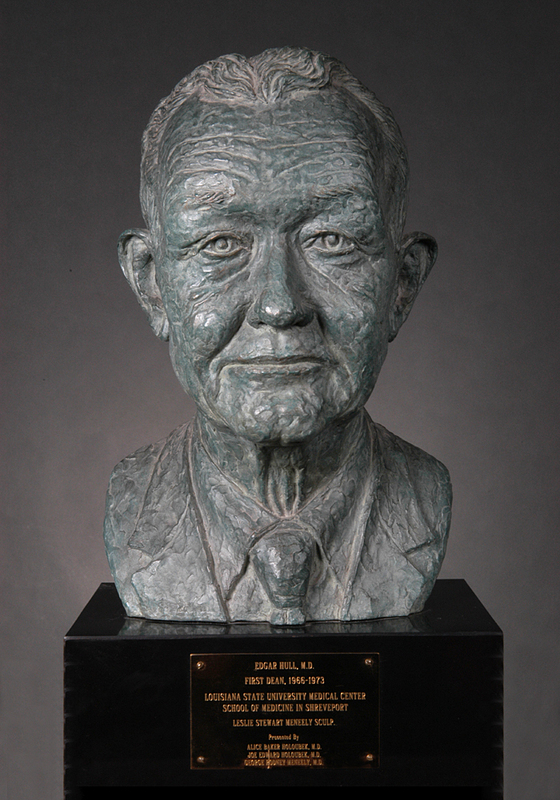 In 1984, well before the Eminent Scholars Program was created, a group of Dr. Hull’s former students dedicated a professorship in his name to express their affection and respect for the man who served as a mentor and role model for thousands of students and hundreds of residents and fellows. Out of further respect, the Internal Medicine Interest Group at the LSU School of Medicine in New Orleans was named the Edgar Hull Society in 2000.